The video on the left implements this technique. You can see how it works, by skipping the stops at the stations in the video. The video on the right is original source video, sped up to match the duration of the video on the left. You can see that it does not skip the stops at the station. I implemented this in Max/MSP/Jitter. The basic algorithm keeps track of the last frame written, and constantly compares the incoming video feed with that frame, calculating a constant difference score that tracks not only the number of differing pixels, but also the amount of difference. When this difference exceeds a defined threshold, then it captures that frame. Comparing against the last frame captured, instead of simply the previous frame, ensures that even gradual changes will be recorded. Get duplicates of any key toiletries (toothbrush, deodorant) and travel accessories (phone chargers, plug adapters) and keep them packed, next to your suitcase. This way you can pack for trips the night before and still brush your teeth before going to the airport. Telling someone to “just be yourself” is rarely good advice. However, telling them to pretend to be someone else opens up the door to learning and transformation. Never buy just one tube of toothpaste. Get two or three at a time, you’ll run out less frequently. Same goes for toilet paper, buy the jumbo pack. Whenever you’re trying to get something done with a group of people, communicate constantly. Communicate more than you might think is necessary. You can’t make anything from a good mango that is better than that. Just eat it raw. Once you get started on a difficult task, it will seem a lot easier. Memories are startlingly inaccurate. Keep records. Revisit them and be surprised. 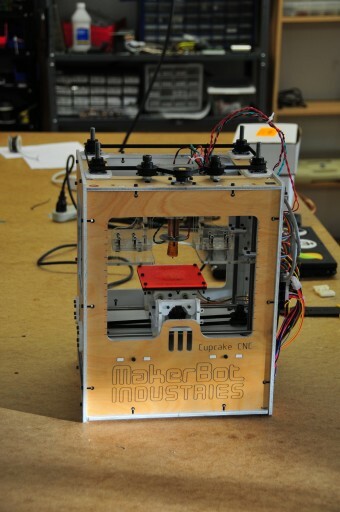 Last time I checked in, I had added the heated build platform and a Paxtruder to the Makerbot. However, things were not quite perfect: things were not sticking to the platform, and I kept getting occasional jams in the nozzle. I could tell things were not quite moving, because I could see the filament “snaking” in the extruder body. 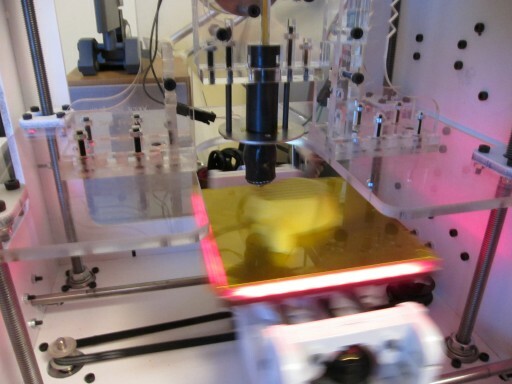 The first problem was solved easily: ordering a roll of 4″ wide thin Kapton tape from here. It just about matches the width of the build platform, adheres easily, and most importantly, hot ABS sticks to it like there’s no tomorrow, with no need to sand it or otherwise prepare it. For the second issue, I turned to the increasingly vibrant 3rd party Makerbot parts market, and ordered a Makergear plastruder. This is a replacement for the Makerbot nozzle, which makes a number of important changes to the design, including a stronger PEEK insulator instead of the existing teflon, a ceramic heating element instead of wrapped nichrome, and a much heavier nozzle head. The Makergear nozzle comes with a clever mounting bracket, but unfortunately it doesn’t fit my Paxtruder, so I salvaged the big retainer washer from another nozzle, and mounted it the 0ld-school way. Nice how you can get two upgrades from completely different sources to work together. These two elements have led to really reliable printing – don’t need a raft, and no filament jams. I printed one half of the Blender monkey, and was pleased with the results. I had been printing slightly hotter than necessary to try to prevent jams, and now I think I can dial the temperature down a bit. 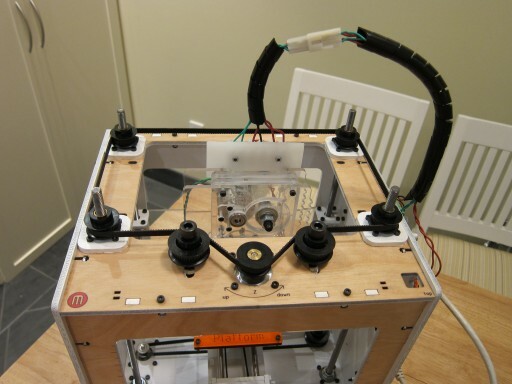 An area that causes problems in the Makerbot is the filament drive mechanism. It has to be adjusted just so, or the filament will get jammed or strip. The system that keeps the filament engaged with the drive wheel is an acrylic idler wheel, which is sometimes uneven or wobbles. Also, the adjustment for idler wheel clearance is finicky, requires two tools (hex key and wrench) and can’t be made while the Makerbot is operating. Fortunately, there is a lot of great innovation on this front: a fellow called Charles Pax has created the Paxtruder, which uses a Delrin piston and a screw mechanism for the filament drive. 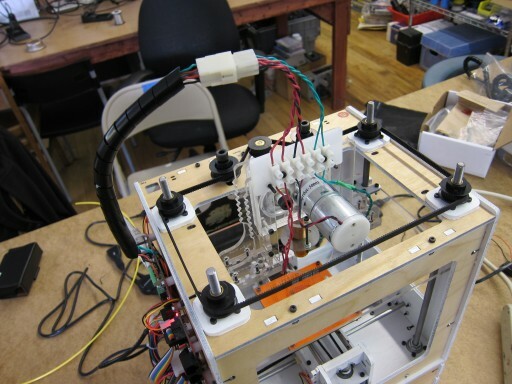 Another member of the Thingiverse community, inspired by this, has created a version of the Paxtruder that is a drop-in replacement for the original extruder body, and uses many of the same parts. It looks great, and works great. It is trivial to get the filament driver pressure exactly right. In addition, the design of the Paxtruder makes it super easy to remove the motor (to clean the gear), and to remove the nozzle assembly. I highly recommend it as an upgrade to the Makerbot. This whole process reflects the power of Open Source hardware: many of the enhancements I’ve made to the Makerbot come from the community, which is empowered to innovate and share. 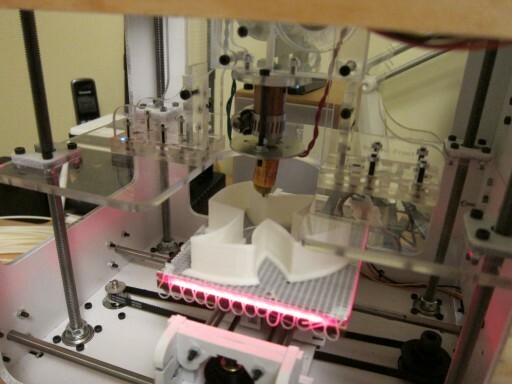 Some of the enhancements can even be made using the Makerbot itself, in a virtuous cycle of machine evolution. Eventually these improvements get rolled into the current production model of the Makerbot. I suspect something like the Paxtruder will be the basis of the upcoming Mk. 5 extruder. When someone asks if you know something, a simple “yes” is rarely the best answer. Stating what you know and confirming it is better. Doing things, however imperfectly, has an effect. Just thinking about things does not. You are not aware of the effect alcohol has on your mind, body and personality until you give it up for a month – and it’s greater than you think. When working with someone skilled in another domain, try to learn enough of what they do to be able to have an informed conversation. Children are not little adults, their lives have an internal logic of their own which should be acknowledged. Fatigue is often a symptom of dehydration – drinking water is sometimes more effective than coffee, or a nap. Paying attention to a safety briefing is always a good idea: the downside might be a few minutes wasted, the upside might be saving your life. First in a series of things I have learned that are not immediately obvious. Added some additional finishing touches to the Makerbot today to make disassembly easier, and make it easier to manage. First, a terminal block mounted on the extruder body. 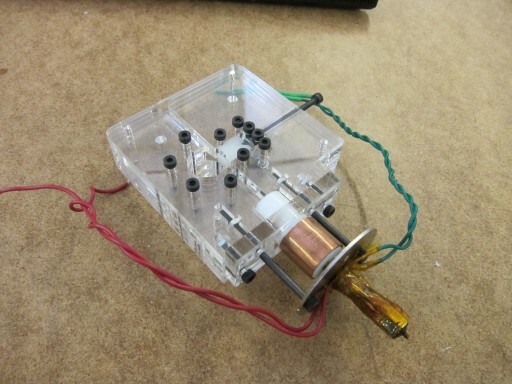 This allows individually disconnecting the motor and the heater barrel from the extruder, and using shorter wires. Unfortunately, the spacing on the bolt holes in the terminal block does not match the spacing of the bolts on the extruder, so I made a simple adapter with a piece of scrap plastic. I also reversed two of the M3 50 bolts, so that the terminal block mounts on the back of the extruder. 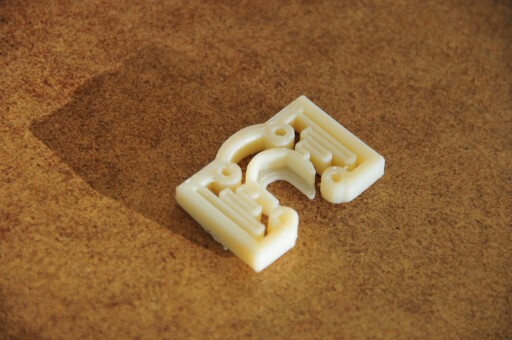 This improves visibility of the filament guide, and makes running the wires from the motor easier. It also makes it possible to remove the extruder motor (ie. for cleaning the drive gear) without taking the extruder out of the Makerbot. Second, I added a 6-pin molex connector into the bundle of cables that runs between the extruder and the controller board, in order to allow for easy disconnection of the entire extruder as a unit. I figure I’ll do the same when the Mk. 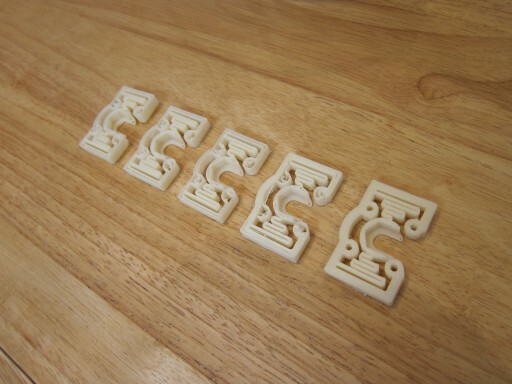 5 extruder becomes available. And finally, some spiral cable wrap to keep everything tidy. It turns out it really helps to keep the cables out of harm way as the Z stage goes up and down. I recently built a Makerbot, and have been working on getting it to print nice-looking objects. This was an interesting learning process, and I thought I’d outline what I did, in case it is of interest. Most of the effort was in configuring a software tool called Skeinforge, a program that will take a 3D model, and interpret it as instructions to a 3D printer. 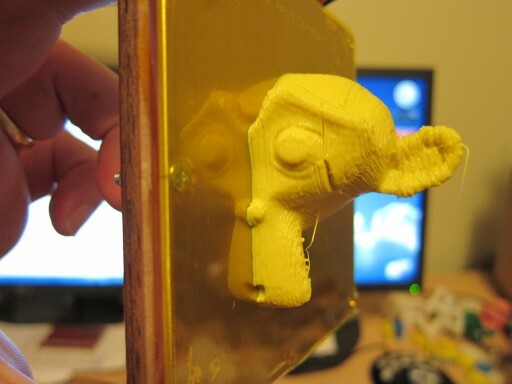 I really wanted to print a piece called a “Z-Axis Wobble Arrester”, an upgrade that improves output from the Makerbot. I was to discover that this is actually a very difficult piece to print, due to the narrow walls and fine tolerances of the “springs”. 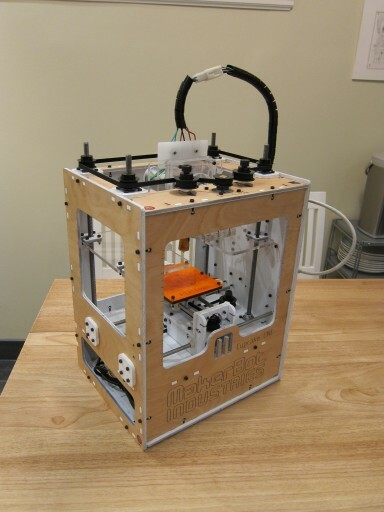 I recently put together Makerbot #1479, from Batch XIII. 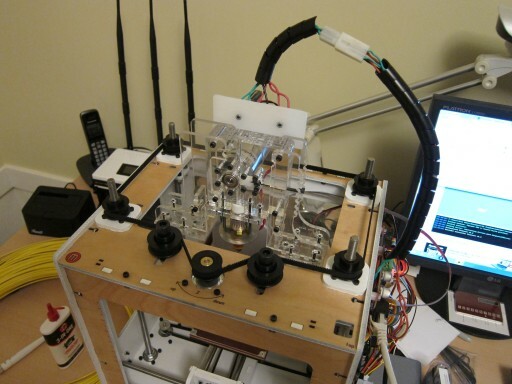 This is a simple 3D printer, a device that actually prints real objects using ABS plastic. It’s sold as a kit of parts for self-assembly. The process was quite straightforward, but I made a number of modifications that seem to make it more reliable and easy to use. Note the elegant paintjob, white interior and two coats of matte urethane on the exterior. The quality of the plywood on recent kits is really nice, and I wanted to show it off. Assembly was pretty straightforward, and the Makerbot kit is very cleverly designed. However, it pays to read the comments on the Wiki at each stage: there are changes and suggestions that are not in the main instruction text. I made a number of modifications along the way, keep reading after the break to hear about them.